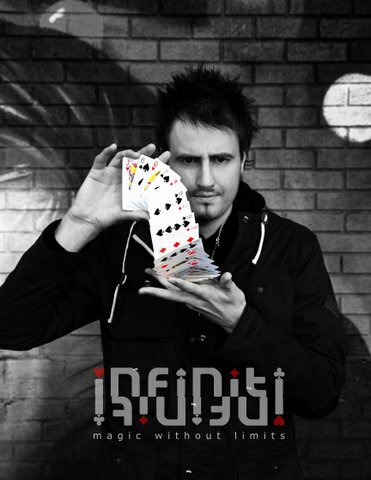 ‘The alternative Dynamo’ with Infiniti Magic in London, Kent, Surrey and Essex. Britain’s most innovative up and coming young street-style magician wil blow your mind! Infiniti has a repertoire of modern day magic and appears to be never ending. His performance style is fast, fresh and super visual. Infiniti has worked alongside Dynamo on the corporate magic scene. He creates new and impossible moments with coins, cards, keys, phones, fire and ice. Infiniti’s customer list includes Selfridges, Sainsburys, Heineken, Nestle, The RAF and Birmingham City Football Club. His close up skills are perfect for bringing private parties, corporate events, exhibitions, road shows, weddings and promotional campaigns to life. Infiniti has tricked the likes of Peter Shilton, Tinie Tempah and Kerry Katona. You will never forget about Infiniti. He will blow your mind and then blow it even more. For magic without limits! Infiniti has tricked his way to success among the stars. He performed at several red carpet events including the 007 Skyfall Premiere. Mark worked at TK Maxx store openings, launch of the five star Melia Dunas Beach Resort in Cape Verde and has featured in the Sunday Mercury. He has also appeared as a magic consultant on tv. Live close up magic with an approach in small groups and captivating his crowd with card tricks, coin bending, mind reading, smoke, fire and ice. Worked his way up to Corporate Support Act for Team Dynamo. Described by agents as ‘The Alternative Dynamo’ for his style and genre of magic. Promises to blow your mind! For more information, bookings or to receive an enquiry please don’t hesitate to contact us at 01322 412494 or send an email to info@platinum-djs.com.